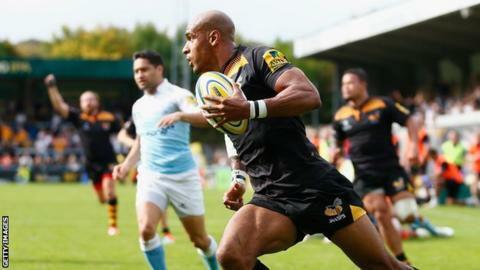 Tom Varndell scored two tries as Wasps extended Newcastle Falcons' miserable winless Premiership run to 20 matches. The hosts led 17-11 at the break, with Andy Goode kicking two penalties and converting tries by Varndell and James Gaskell. Newcastle responded with two Juan Pablo Socino kicks and a Ruki Tipuna score. A third Goode penalty, second Verndall effort and Rob Miller score put Wasps in control, while Falcons finished with a late penalty-try consolation. Only two sides have now gone longer without a Premiership win in the competition's 27-year history - Rotherham and Worcester. Relegated Worcester went over a year without winning in the league last term, enduring 22 straight defeats until they won at Newcastle on Easter Sunday. The worst run of results in Premiership history is the 30 consecutive defeats by Rotherham Titans, which began in February 2001 and then stretched all the way through the 2003-04 season. Falcons' most recent league win was their 13-11 home victory against London Irish on 27 October 2013. They now face Exeter (home) and London Welsh (away) knowing that, if they lose both, they would match Worcester's 22 losses, with the prospect of a trip to Bath to follow. Wasps' second home win this season moves them to fifth in the table. The Falcons opened the scoring with Socino teeing up his first kick inside two minutes, with Wasps hitting back through Varndell, who linked up with Elliot Daly for his third try of the season. Goode traded kicks with Socino, but again the hosts extended their advantage as Gaskell won possession at a lineout in Newcastle's 22 before getting on the end of an Ashley Johnson off-load to touch down. Tipuna went over before the break, but Socino failed to add the extras having also missed an earlier penalty and the chance to keep the pressure on Wasps. Goode kicked the hosts further ahead after the interval and Johnson helped create Wasps' third try, bursting away for a 30-metre run before putting Varndell through in the corner. Miller added the extras and then linked up with Christian Wade to run in their bonus-point try from half-way. While Wade made an attacking impact off the bench he finished the match in the sin bin having conceded penalty try as he attempted to intercept a pass on his try line. "I didn't think we were inspiring, as parts of our game were messy. "We were looking shaky at times and, if you give the opposition five or six opportunities close to our line, they are going to score. "Newcastle are a very hard team to put away. All credit to them as they battled to the end, but we could only get a bonus-point win from this game and that's what we've got so I'm satisfied." "We lost the game because we made too many individual errors and it cost us dear. "Last season our aim was to avoid relegation, which we did, but we scored only one try in our first five or six games. This season we are scoring tries which is a good thing." Wasps: Miller; Tagicakibau, Daly, Leiua, Varndell; Goode, Simpson; Mullan, Festuccia, Cooper-Woolley; Gaskell, Myall; Johnson, Haskell (capt), Jackson. Replacements: Lindsay, Yapp, Cittadini, Cannon, Hughes, Davies, Masi, Wade. Newcastle Falcons: Hammersley; Tait, Tiesi, Powell, Sinoti; Socino, Tipuna; Brookes, Lawson, Wilson; Green, Barrow; Wilson, Welch (capt), Hogg. Replacements: Rogers, Hawkins, Tomaszczyk, Furno, Mayhew, Fury, Clegg, Tuilagi.